This week the Mail on Sunday focuses a lot on Christian Eriksen’s future. The Dane, 27, has six goals and 12 assists in the Premier League this season. Eriksen signed for Tottenham from Ajax in 2013 and has since become a star in English football, replicating his classy performances on the European stage for Spurs too. His contract with Spurs expires in 2020 and nothing is set in stone for the player’s future. This is a player who has attracted interest from the likes of Barcelona and Real Madrid, so it was only a matter of time before Manchester United were added to the list of potentially interested parties. The Daily Mail believes that United could tempt the playmaker to join the club. 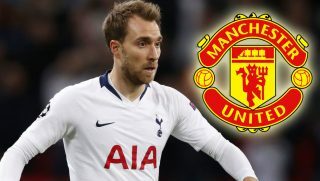 We will know over time how genuine this report is… but it would be interesting to see a creative spark like Eriksen join United’s midfield, especially with Ander Herrera and Juan Mata both looking likely to depart at the end of the season. It would be a huge blow to Mauricio Pochettino if Eriksen was to leave though. If Spurs start losing their best players now, he will be wishing the United job was still vacant. Any belief that Spurs would spend money from a sale wisely goes out the window when you look back to the funds received from Real Madrid for star player Gareth Bale in 2013. It will be interesting to see how this one plans out. What a player! Four months ago, Sky Sports ran a segment on The Debate about Christian Eriksen’s future. It came around the time Pochettino stated his hopes that the Dane would commit long-term to Tottenham. This shows his future has been up in the air for some time, yet he continues to pull the strings for Spurs.